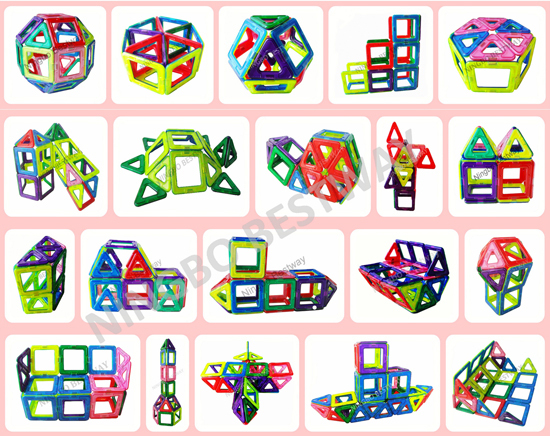 Magformers is made from plastic and super magnet, the main shape is triangle and square. The magnets are completely encapsulated in the plastic, not glued in the edge. Magnet can be rotated and easily connected, and there is no difference between N pole and S pole. Through the magnet connection, you can easily make a sphere, pyramid, cube. And then turned into a variety modeling and basic construction frame.It could help children to develop the creativity and imagination. The Magformers is made from triangle and square plastic with strong magnet in it. You also could choose the quantity of the triangle and square for each set. •	Explore and experiment with these two geometrical shapes, the square and triangle to create simple and complex 3-D models. •	Feel the magnetic force and have countless hours of fun exploring the Magnetic Construction Toy connection possibilities! Round Plastic jar with a instruction book in it. We also could supply other kind of package according to your request !